David Murphy has managed to publish five books, three of which deal with zombies, but there’s a lot going on behind the scenes. Murphy said he grew up making fun of bad television, and that’s where his ideas for the books first began to accumulate. “There’s a lot of paranoia in the world, about it ending, about politics. There’s a lot of beauty too,” Murphy said. Murphy has always been a writer. “I’ve written since I was a teenager. It’s all similar; music and songwriting is just a shorter version of writing.” And he has always liked horror, zombies and comics. Murphy was automatically drawn to “Night of the Living Dead” because it showed what directors can do with shoestring budgets. Murphy’s first book, “Zombies for Zombies: Advice and Etiquette for the Living Dead,” came out in 2009 and started it all. And budgets can often be an issue. Murphy can exercise his creative juices with more ease in Omaha because it’s cheaper to live here. That way he has more time for the artistic process to become more fluid. 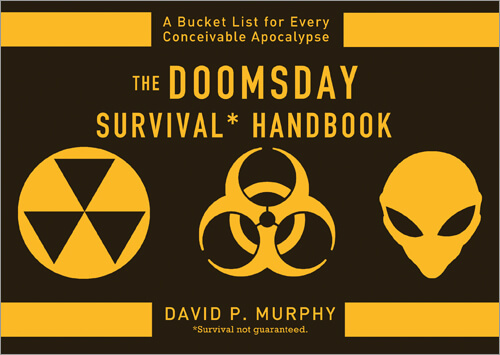 His latest book, “The Doomsday Survival Handbook,” was partially conceived when Murphy decided to poke fun at the chaos surrounding the upcoming 2012 apocalypse. Murphy said the scenario for stories usually comes first followed by the dumbest way possible for each scenario to unfold. The Grim Reapress rates the gore and scare levels on her amount of delight in pain, which adds comedic spice to the stories. Of course, there are challenges in the creative process. Murphy pointed out that conveying comedy on paper is a lot harder than in person. “You only have words and maybe italics,” said Murphy. “It’s a noble endeavor.” There’s a distinct lack of facial expressions and vocal tones to suggest humor. Succeeding as a writer is a big chore in today’s economy, but there are people like Murphy willing to persist. Writing a proposal is how you get your foot in the door. “It’s your chance to showcase your vision,” said Murphy. According to Murphy, you have to show vision that stretches beyond other authors in the field and compare yourself to equivalent books in your niche while showing your unique take on everything. Chicago’s Sourcebooks has been the publisher of Murphy’s first four books. “Rapturella and Other Apocalyptic Tales,” Murphy’s fifth book, is a collection of short stories and is meant to complement “Doomsday.” Rapturella is self-published. “I thought it was time to take the bull by the horns and publish my own book,” Murphy said. According to Murphy, he made a conscious effort to publish Doomsday and Rapturella next to each other because there are scenarios in Doomsday that appear in Rapturella. It’s good for authors to be able to get their hands dirty in the publishing process. “Doomsday” opens with some comforting lines about how we’re all sitting ducks for disaster, mayhem and, well, zombies! Murphy doesn’t sugarcoat anything, and the reader immediately should realize their own mortality is nothing to mess with in the chaotic world we live in. His books are available locally at various stores, including Barnes & Noble, City Limits and The Bookworm and, of course, on the Internet. He’s also a pianist who plays at Jackson St. Tavern Friday and Saturday evenings. For more information about David, please go to davidpmurphy.com.